Free food is the best food, which is why I love this time of the year in the Pacific Northwest. 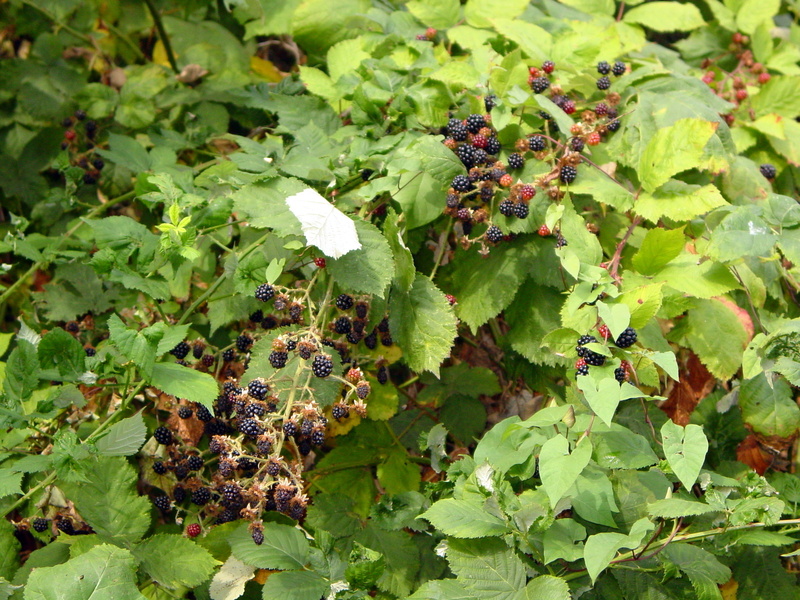 We have the perfect weather for blackberry growing. It's not too hot, not too cold. This is a picture from a bush growing along the side of the road by my house. Blackberries are everywhere this time of the year. I can't pass up free stuff, so I have been picking and freezing for the past month. I'm sure this tip is nothing new, but if you put the fruit on a cookie tray, then freeze it flat for about 2 hours, then bag it, your fruit is easier to use when you are ready for it. I use blackberries in smoothies, in pancakes, and in blackberry cobbler. Today I thought I would share with you my favorite recipe for cobbler. Mix until crumbly. Press 1/2 of the mixture into a greased 9" pie plate. 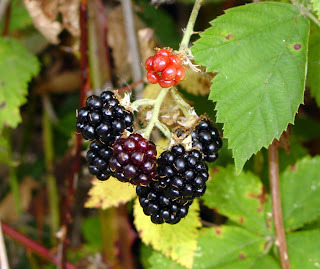 Cover with 4 cups of blackberries (you can also use rhubarb or blueberries). Combine 1 cup sugar, 3 T tapioca (or 2 T corn starch), 1 cup water and 1 tsp vanilla in saucepan. Cook on medium heat stirring often until thick and "clear". Pour over fruit. Top with remaining crumbs and bake at 350 degrees for 1 hour. Yum yum yum. We are surrounded by them and rather than fight them, we embrace them. 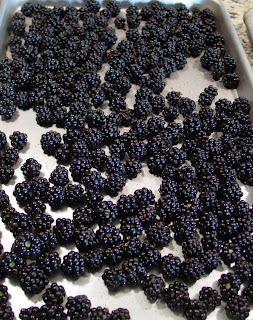 I pick tons, freeze them, use them all year long in smoothies, baking, salad dressing etc.